This year’s St Patrick’s Festival has got the biggest individual festival grant for 2014 from Failte Ireland with €1 million being made available to build on success of The Gathering. “The St Patrick’s Festival is now one of Ireland’s leading events and a great showcase for Ireland,” Minister Varadkar said. The 2014 Festival will include a series of high-quality, tailored cultural events on the theme of ‘I Love My City’. These will be held in key cultural institutions across Dublin City. 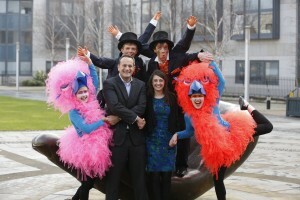 The programme was devised to communicate the message that Dublin is ‘open’ on St Patrick’s weekend and to give, tourists and Irish audiences, an opportunity to attend unique events in unique venues. 2014 will also see the start of a three year programme in which the Festival will link in to the significant commemorations to be held in the period 2014-2016. Fáilte Ireland has also confirmed funding of €36,000 to support the Temple Bar TradFest from 22-26 January 2014. The festival is a firm favourite on the festival calendar. This year it will showcase Irish music and culture and get the 2014 Festival year off to a flying start. The 2014 festivals application process opened on Friday 6th December and information is available on the Fáilte Ireland website including guidelines for both regional and national festivals for applicants. “The special year of the Gathering 2013 was a wonderful opportunity to shine a spotlight on Ireland in our overseas markets. This funding will help the St Patrick’s Festival and the Temple Bar TradFest will carry on the momentum generated in 2013 and provide a great experience for visitors,” Minister Varadkar added.